Education experts on The Amphibian Project team have reviewed multiple sources of amphibian curricula available today and have assembled the best materials for your use here, in no particular order. These materials include both conceptual and hands-on projects. We have provided direct links to the source of the materials below. Choose as many of the activities as you like and incorporate them into your regular classroom curricula. Please see below for descriptions of amphibian-related activities and links to associated resources. This page can also be downloaded as a pdf file. 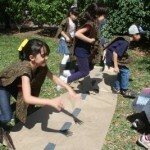 Are you in need of a fun, easy and interactive amphibian related activity for your next festival or event?! Try the Toad Maze! 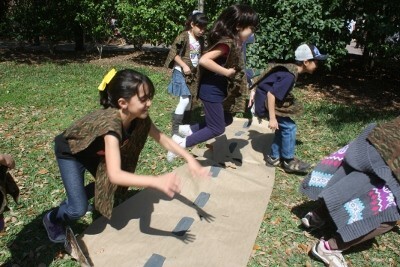 This original and outrageous obstacle course can be set up in the classroom or the great outdoors utilizing a few simple materials you might have lying around. Use your creativity and adapt it to fit your available resources, focal species or specific conservation issue. This can be the salamander, frog or caecilian maze too! Audiences range from 2 years old to adult! Contact rachel@amphibianark.org. AArk e-books K-6 AArk tiene una nueva serie de audiolibros para niños – CHÉCALA! Amphibian Art Curriculum K-3 A new way for children to learn about amphibians and express appreciation of this ‘living art’ through their own artistic work. The Vanishing Frog 3-5 Investigate the current situation and reasons behind the global amphibian crisis. Draw conclusions, summarize, and present important information about the plight of amphibians. The Vanishing Frog 6-8 Research an endangered or threatened amphibian species. Identify strategies for saving one amphibian species. Persuade others to take action to save the species. The Vanishing Frog 9-12 Debate critical issues about the current global plight of the amphibians. Identify specific strategies that could help save the amphibians. Create an action plan for applying service to their own community. La Desaparición de las Ranas 3ro – 5to de primaria The Vanishing Frog, adaptado a américa latina y el Perú por Grupo RANA – Respuestas y Acciones para la Naturaleza y sus Amenazas. Investigar la situación actual y las razones detrás de la crisis mundial de los anfibios. Obtener conclusiones, resumir y presentar información importante sobre la situación de los anfibios. La Desaparición de las Ranas 6to – de primaria a 2 de secundaria The Vanishing Frog, adaptado a américa latina y el Perú por Grupo RANA – Respuestas y Acciones para la Naturaleza y sus Amenazas. Investigar una especie de anfibio en peligro o amenazada. Identificar estrategias para salvar a una especie de anfibio. Persuadir a otros a tomar medidas para salvar a la especie. La Desaparición de las Ranas 3ro – 5to de secundaria The Vanishing Frog, adaptado a américa latina y el Perú por Grupo RANA – Respuestas y Acciones para la Naturaleza y sus Amenazas. Debatir temas críticos sobre la difícil situación mundial de los anfibios. Identificar estrategias específicas que podrían ayudar a salvar a los anfibios. Crear un plan de acción para aplicar el servicio a su propia comunidad. An Educator’s Guide to the Houston Toad K-6 The Houston Toad is one of the most endangered amphibians in North America. This very comprehensive book delivers a wide range of lessons and activities some of which are specific to the Houston Toad, and others which could be applied to any species of frogs and toads. It’s Not Easy Being Green upper elementary-lower middle school This is an up-to-date complete curriculum. Chapters, with lesson plans and activities, are on a variety of topics, including declines, deformities, culture, anatomy, habitat and more. Although created for by the Alaska Department of Fish & Game, the materials can be adapted to any state. A Thousand Friends of Frogs K-12 Written by the Center for Global Environmental Education originally in response to the students in Minnesota discovering malformed frogs in 1995, the updated Educator’s Activity Guide can be purchased for $10. There are several lesson plans available on the website for free, including The Case for the Missing Anurans that use characters Sheerluck Biomes and Dr. Newt Watson to investigate the causes of declines. Reviled and Revered 3-8 A series of five activities from the Smithsonian that cover topics such as people’s attitudes and misconceptions about herps, what are the differences between amphibians and reptiles and how are amphibians and reptiles like or not like people. Facts and Folklore 6-8 From Discovery, some lesson activities are provided and teachers can purchase a video that will discover some of the amazing ways frogs survive and breed in the wild, explore their historical importance, and learn why they’re so valuable to the environment. Ribbit! Ribbit! K-2 Designed by Christine Gorman, this thematic unit is great for ESL students. Can be adapted for grades 3-5. Virtual Frog Dissection 7 Developed by Danielle D. Ulerich at the University of Pittsburgh, this lesson introduces students to frog anatomy. Frogs: A Thematic Unit Plan 2 Lesson developed by Lisa Turturice which includes activities to incorporate frogs into different subjects such as art, physical education, literature, math and others. Survival of the Mutant Toad 3-6 Retha M. Edens at Saint Louis University, this lesson and activity about amphibian camouflage involves graphing and vocabulary. The Frog Beyond the Fairy Tale Character: Searching Informational Texts K-2 Students examine their prior knowledge, make predictions about frogs, and verify their predictions through research on the Internet. Developed by Janet Beyersdorfer. The Teachers Guide K-12 A variety of lesson plans not listed above. The Vanishing Frog 3-12 Discovery education created lesson plans for elementary, middle and high school. Build a Frog Pond K-12 Planet Patrol shows you how to build a frog pond in your garden. Raise Native Tadpoles K-12 Although raising tadpoles will be exciting and educational for students, it isn’t as easy as it sounds. We have provided some guidelines and a care sheet. Raise Poison Frogs K-12 Colorful and charismatic poison frogs are commonly bred in captivity. Breeders and hobbyists may be willing to provide frogs, tadpoles, or eggs. They will require a tropical microcosm and absolutely cannot be released. They are not native to the United States and will not survive if released. If you are interested in trying this option, contact us and we will reach out to breeders for you. Learn about Vernal Pools K-12 The Vernal Pool Association has a variety of examples of school projects involving vernal pools. FrogWatch USA K-12 FrogWatch USA is an AZA (Association of Zoos and Aquariums) program to engage citizens in collecting local frog population data in neighborhoods across the country. The site also has state by state information on the frogs in your area. Download the AArk’s Teach the Amphibian Crisis document, that was put together as part of the Year of the Frog campaign. Download more Helpful Links for Educators.